Portland, OR – Kim “Rocket Mean” Stegeman, executive director of the Rose City Rollers, will give a short talk at The Hollywood Theatre’s showing of “Kansas City Bomber” tonight, April 1st as part of its #OREGONMADE Film Series. Tickets can be purchased through the Hollywood Theatre website or at the door. That changed in the early 2000’s with the birth of modern flat track roller derby…and Portland’s Rose City Rollers were there from the start, launching in 2004. The Wheels of Justice’s Loren Mutch skates against Seattle’s Rat City Roller Girls at a bout last August. And for Portland, perhaps a bigger deal than many of the city’s residents might appreciate: the Rose City Rollers’ premier All Star team, the Wheels of Justice, are currently ranked the #1 team in the world. Their championship win at the International Championships in New Orleans last November was the third time they’ve brought The Hydra back to Portland in the last four years. 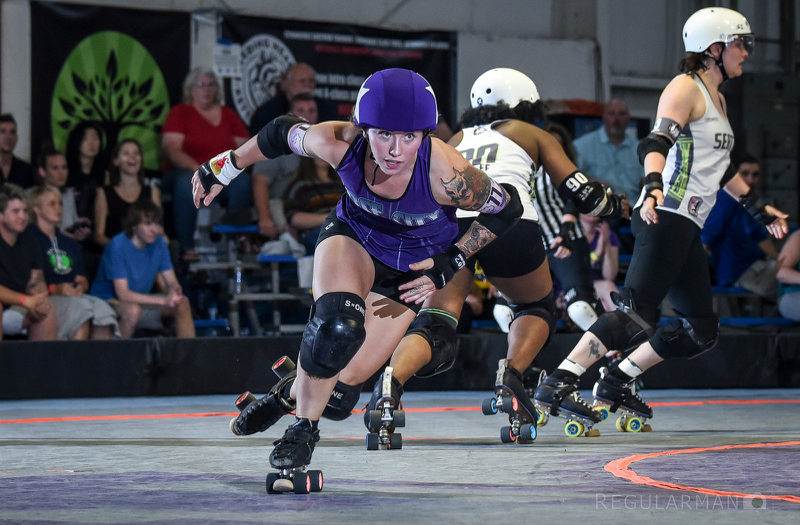 Residents of the Portland metropolitan area will be able to see Rose City Rollers’ top skaters when the league’s All Stars take the track for their 2019 debut at the “Wheels vs. Justice” exhibition bout on Saturday, 4/5. Tickets for all of the league’s upcoming events can be purchased at www.rosecityrollers.com. Press are invited to attend our upcoming games this weekend, and accommodations can be made for photographers and reporters upon request. Please contact Rose City Rollers Marketing Manager, Meg Patterson, for more info: meg@rosecityrollers.com.